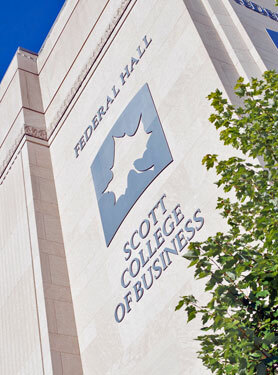 This set of guidelines will help you get the most from your experience at the Scott College of Business and the MSDC. They will help build your resume and prepare you for your professional life. Attend Meis Center workshops early! Check the bulletin board outside of the Meis Center for internship postings! Look for networking events to attend within your career/industry area! The more times you practice, the more comfortable you’ll be for the real thing! Almost every job you apply for will require professional references. Think outside the box—all companies need marketing executives, HR staff, accountants, etc. If you have questions specific to your situation or general questions then ask! We are all here to help you succeed. Contact the Career Center, The Meis Student Development Center, or your professors!